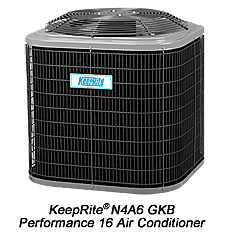 The new energy-efficient KeepRite N4A6 GKB Performance 16 air conditioners are here, offering you and your customers the winning combination of superior efficiency, increased cooling capacity, and shorter, narrower flush-fit furnace and coil combinations. Achieving 16 SEER / 13 EER cooling efficiency (up to 17 SEER / 13 EER for select combinations), the N4A6 GKB Performance 16 meets the requirements of ENERGY STAR®1 (select sizes), HERS®2 (Home Energy Rating System) and Title 24. These new models also meet the Minimum Efficiency Requirements for Split-System Air Conditioners throughout the U.S. so they can be sold in every region. KeepRite engineers designed these new 16 SEER air conditioners for improved cooling performance. Select units have a larger footprint and/or height for increased efficiency. Due to increased cooling capacity, the new 16 SEER 5-ton size requires a larger wire and circuit breaker size compared to the current 16 SEER air conditioner models. *All dates are subject to change. Please contact your distributor for more details on product availability. Achieving 16 SEER /13 EER in 1.5- to 5-ton sizes, the KeepRite N4A6 GKB Performance 16 air conditioners offer the winning combination of superior efficiency and cooling capacity. If you and your customers are looking for an efficient and affordable single-stage air conditioner, the N4A6 GKB can't be beat! 1ENERGY STAR is a registered trademark of the U.S. Environmental Protection Agency and the U.S. Department of Energy. Many models are ENERGY STAR qualified. Proper sizing and installation of equipment is critical to achieve optimal performance. Split system heat pumps must be matched with the appropriate coil components to meet ENERGY STAR criteria. 2 HERS is a registered trademark of the Residential Energy Services Network (RESNET). 3Timely registration required for 10-year parts limited warranty. Limited warranty period is 5 years for parts if not registered within 90 days of installation. Jurisdictions where warranty benefits cannot be conditioned on registration will receive the registered limited warranty periods. Please see warranty certificate for further details and restrictions.